Brick has pretty much been around since there were building materials. It began its popularity in American homes as the centerpiece, the chimney. Since trees were abundant most early Colonial homes brick use was initially limited to the initial chimney. Brick escalated as a primary building material during the Georgian era of American home building. Genuine clay brick is made from natural materials. Brick is primarily made from clay along with shale – among the most abundant, naturally occurring materials on earth. Brick offers superior fire protection, high wind protection, moisture and insect control. Brick can be repeatedly salvaged. Brick has more than a 100-year lifespan and it’s not uncommon to see century-old buildings still in use. Maybe the best advantage of all – the older it is, the better it looks! No wonder brick is making a great comeback! Drywall can hide a lot of secrets including beautiful brick walls to the surprise and delight of many homeowners and designers. Exposing the brick can be a bit laborious and very messy but the results are absolutely worth it. Exposed brick immediately adds interest, character, warmth, and texture. Whether it’s left raw or you choose to paint it, newly revealed brick interiors are coveted and have become one of the latest and hottest trends in home design. Normally, when you think of a design trend you think of a limited life-span but brick is, and remains, timeless and suits every design style, size of home and shape. Nothing adds to the architectural style and charm of a home like brick. Building standards have changed so much over the decades that mass-produced building components, instant framing modules, and other systems have intentionally resulted in more homes being built at faster rates and for less money and that leaves building solid brick homes scarcer than ever before. No wonder the discovery of a brick wall in your home is so exciting. Original, vintage brick creates a warmth in even the most modern homes and can be incorporated into every style and look. Whether a fan of box-style modern homes: clean, white and crisp or a fan of homes of days gone by like Craftsman or Victorian, brick works. Because brick varies so greatly in color it can be painted to suit your home’s own unique style. Warm whites and soft grays look wonderful in more modern spaces while rich reds, ambers and darker colors are right at home in rustic, old-world spaces. If you have a home with a brick interior or a single accent wall it’s probably irreplaceable so take care of it. Hanging anything on brick should be done by a handyman familiar with brick and who has the right tools and knowledge to get the job done without damaging the brick. The same advice applies to painting your brick walls or brick fireplace. It’s well worth it to hire a professional. The steps themselves aren’t especially complicated but if you’re used to a roller and a paintbrush and a primed flat surface your brick walls are not the place to learn. There are a number of products that are formulated just for masonry and will adhere and last for years as opposed to products made for other surfaces. Your professional will know which products are best. If you are a committed DIY’er be prepared to clean the brick surface thoroughly with a stiff bristle brush and some TSP before you think of taking another step. If you really like the look of brick, and who doesn’t, but don’t have those luxurious brick walls, you can still create beautiful texture and drama on a smaller scale by introducing a brick design into the kitchen as a backsplash. A brick backsplash will create a stunning feature that enriches the whole room. Even in limited-use raw brick creates a new ‘historic’ element that adds warmth, color, and texture to a room. Brick exteriors are equally desirable as virtually no other building material offers the same comforts. And few other materials are as substantial and can make you feel as secure. Home maintenance practically disappears. 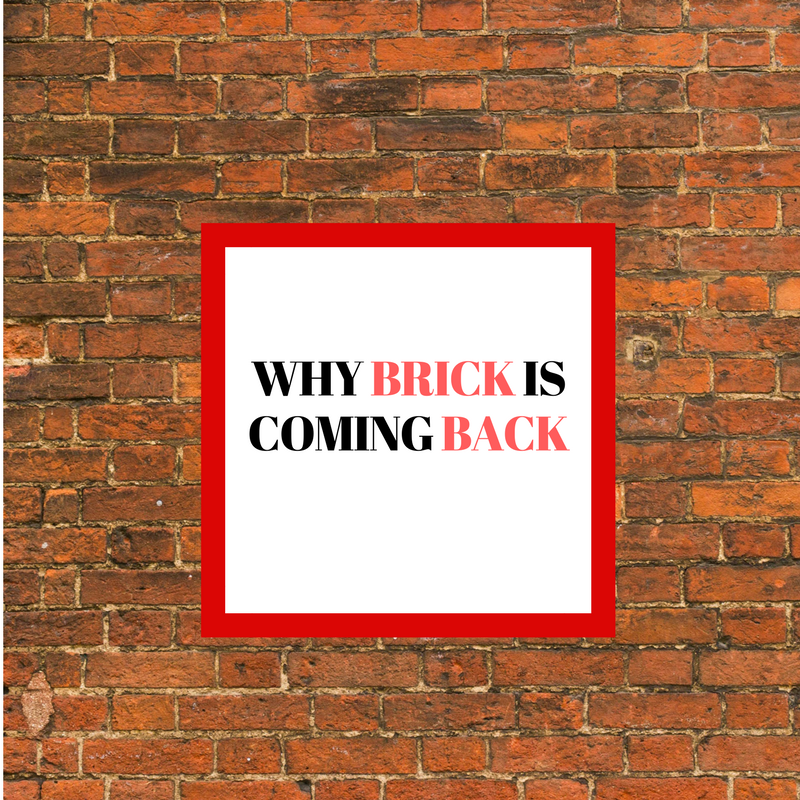 Brick is a natural noise reducer and keeps you from the sound of wind and rain and traffic. Few homes offer more durability than brick homes. For many, a brick home conveys quality, substance and classic style. Whether inside or outside brick is timeless and exposed interior brick walls are truly a luxury too few homeowners have. While brick is practical beyond measure it is also the essence of history, elegance, and warmth all at the same time.